Trone said he and his brother make donations to elected officials whom they believe have an interest in furthering “the common good” and who support economic initiatives that benefit the consumer. 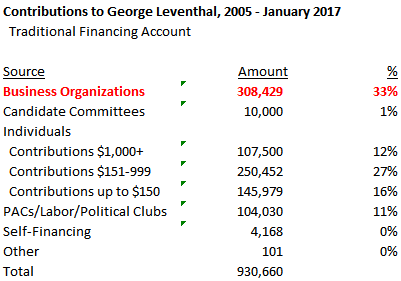 Leventhal says that he has never allowed any contributor to “buy access” but is well known for his support of development interests. While he contends otherwise, Leventhal’s situation is no different from that of any other person who accepted money from the Trone brothers. Except that not all of his colleagues took as much “big money” in the past as Leventhal. Marc Elrich, another rival for county executive, received very little from business. 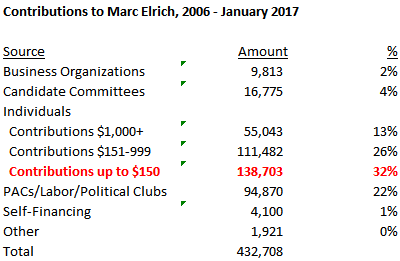 The 32% share of Elrich’s contributions from individual donations under $150 was also twice as high as the 16% of Leventhal’s contributions. Following the debate on raising the minimum wage, this is now the second issue in a very short period on which George Leventhal has hugged Marc Elrich tightly. Abandoning his past business ties, Leventhal touts a $15/hour minimum wage with the fervor of a convert, and regularly plugs his embrace of public financing. The strategy of imprinting himself in the media as the true progressive tribune is not a bad one. In recent weeks, his combination of abrasive outspokenness has gained him more media attention than his rivals. As Trump showed in the Republican primary, that can work wonders. On the other hand, Leventhal has a long record. Will his new embrace of a much higher minimum wage and attacks on major campaign contributions gain him progressive support? Or will it just leave primary voters wondering why they should vote for mini-Marc when Marc is also on the ballot?